After arriving to Ho Chi Minh City and getting settled at An Tam Hotel 3 located in a back alley of district 1, my girlfriend and I decided to get some food. Since it was our first meal in Vietnam, we wanted an authentic Vietnamese meal. We walked down the alley that our hotel was situated and asked the first Vietnamese local to point us in the right direction. He immediately points to a shop across the street and raises his right hand pointing with his index finger and saying, “number 1! number 1!.” It must be good, I think to myself. We try to cross the busy street and maneuver next to motorcycles as we are salivating at the thought of a good meal. If you are not familiar with Pho, it is a traditional Vietnamese soup with rice noodles, vegetables and some type of meat. The restaurant is very traditional and local. We were the only foreigners in the restaurant and we sat on small stools at a metal table. The menu was translated in English but we already knew what we wanted. We asked for vegetable Pho but they did not have it so we both ordered Pho Soup with Seafood and two Saigon Beers. The Beers were 15,000 Dong each or 0.70 USD. Nice! The Pho arrived and was a big healthy portion. There was a variety of seafood but the red shrimp stood out visually. Accompanied with the Pho was a small dish of cut limes and a large dish of fresh bean sprouts and lettuce. On the table there were an assortment of condiments including chili paste, fish sauce, soy sauce and sugar. Overall, it was a fantastic meal that totaled 50,000 Dong or $2.33 USD. Not bad. 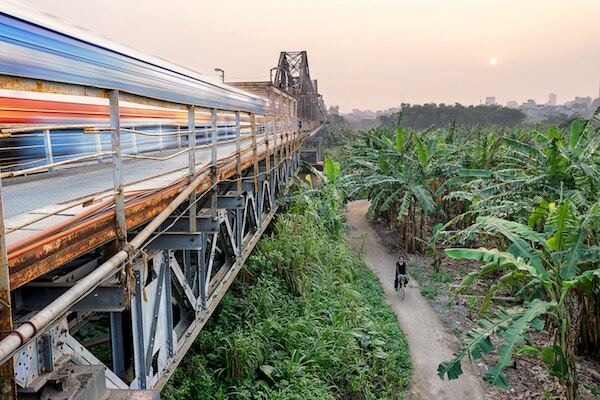 We are traveling north through Vietnam from Ho Chi Minh to Hanoi. We do not have a set itinerary but we have places that we want to visit. Neither of us have been to Ho Chi Minh city and do not know what there is to see. We did some preliminary planning and research and decided that we wanted to visit the following, Cu Chi Tunnels, Co Dai temple, The War Remnants Museum, Notre Dame, and post office. 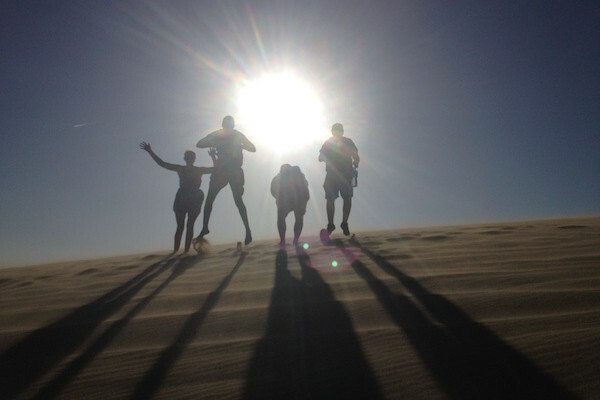 We also wanted to explore the city on foot and stop anywhere else that looked interesting. 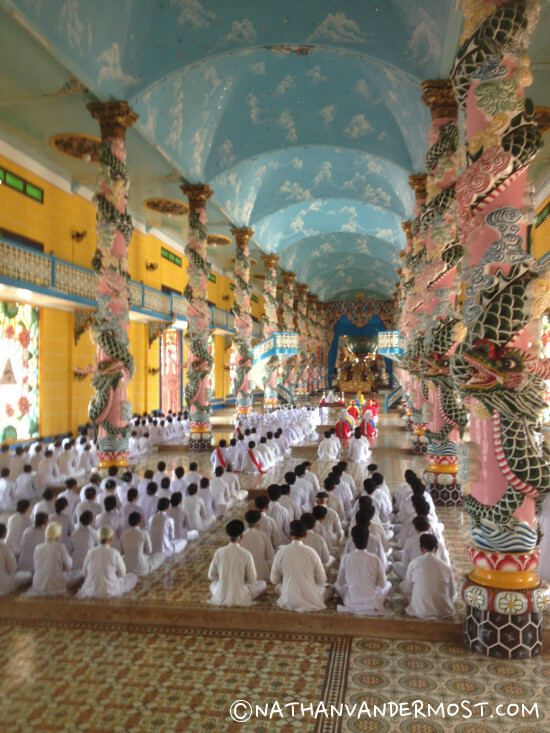 We signed up for a day tour which included visiting the Cao Dai temple and the Cu Chi Tunnels. We booked a day tour with a local tour agent and it cost $7 USD. The tour group consisted of roughly 20 people and one tour guide, Mr. Bin. 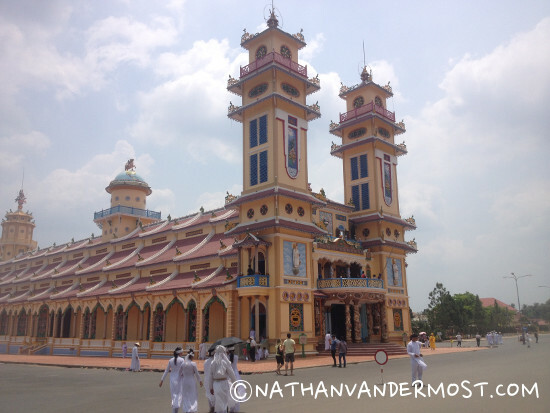 The 1st stop of the tour was at the Cao Dai temple. Although, the tour guide claimed that it is not a tourist attraction because it is a real religious site, the opposite was true. The bus parked at a gate and we walked a short distance to the temple. The temple is very beautiful from the outside as there are many intricate drawings and vibrant colors. The outside of the temple has a brick walkway that surrounds the temple. It is disrespectful to walk on it with your shoes or sandals. There are signs asking that you take off your shoes before you go into the temple. We coincidentally visited on a sunday which is a religious day to go to the temple. People could not enter the temple until the ceremony began so there was a long line of tourists waiting. Once inside, you were limited to where you could go. There were opportunities to take photos and the inside of the temple was amazing. The amount of tourists that were talking and moving around was definitely distasteful. We were there for one hour and then had to return to the bus. Following the visit of the Cao Dai temple we were off to the Cu Chi Tunnels. The drive from the temple was about one hour. During this time, our tour guide, Mr. Bin told us stories about his past in Vietnam and the significance of the war. Once we arrived and paid our admission fee of 110,000 Dong or $5 USD, we were able to enter. Whenever we did research of the Cu Chi tunnels, we envisioned that we would be crawling through an intricate trail system but we were disappointed. Mr Bin, our tour guide led us through several exhibits that showed different traps that were used during the war, a blown up U.S. tank, B-52 bomb crater, and the tunnels. The tour led us from one exhibit to the next with the chance to listen to war stories and explanations of the exhibit. Roughly, mid-way through the exhibit there is a gun range in which you can shoot an Ak-47, M-16, and more. 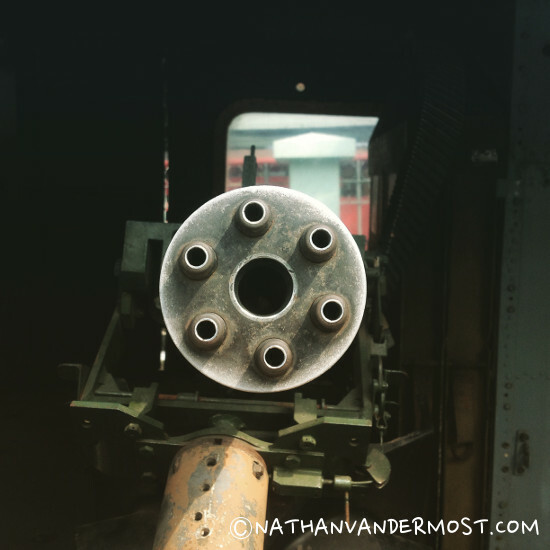 Depending on the gun and the round the cost can vary from 30,000 Dong per bullet and up with a minimum of 10 rounds. I did not have the urge to fire any guns so I waited patiently while others in the group did. 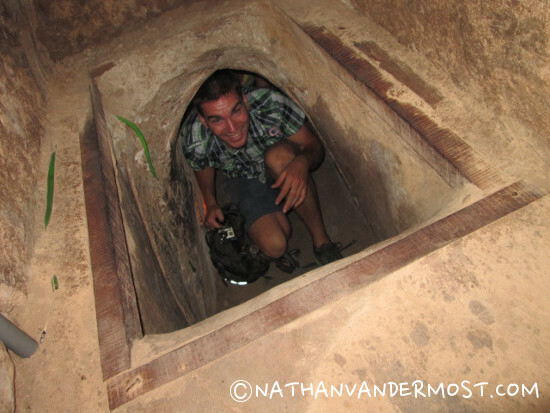 The tour ended with the chance to crawl through up to 100 meters of the Cu Chi tunnels. The tunnels have been modified to be wider so that tourists can fit easily. 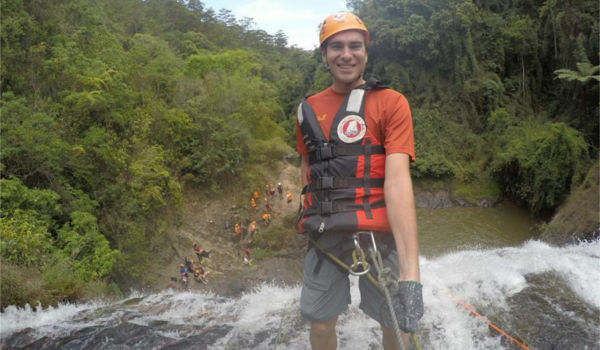 I am 6′ 3” and was able to get through the tunnels relatively easily. I spent a lot of time crawling and getting dirty but it was the highlight experience. 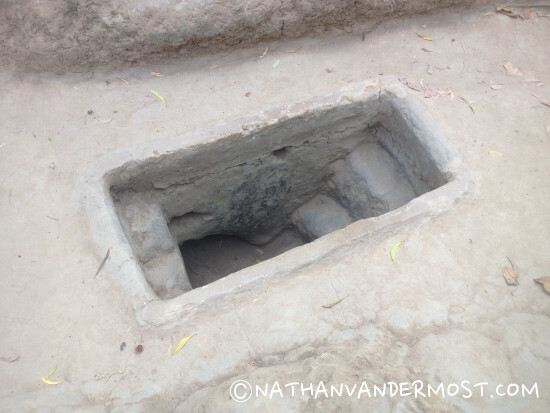 Overall, the Cu Chi tunnels were very touristy and I was hoping that they would have offered more. Originally, I was expecting that the tour would include more tunnel exploration but that was hardly the case. Prior to arriving we had read about many museums that you can visit and other points of interest but I am definitely glad that we stopped at the War Remnants Museum. 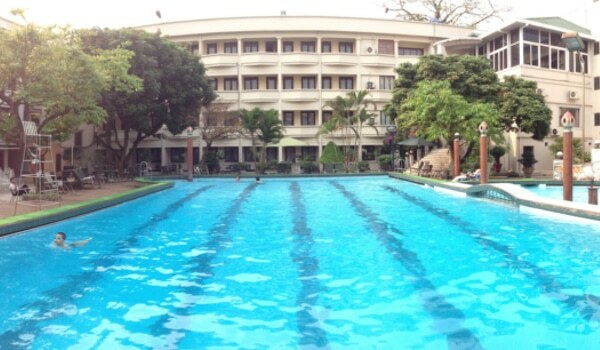 It is in easy walking distance from District 1 but you can also easily access it by taxi. We arrived in the early afternoon and it was packed with other visitors. The entrance fee is 15,000 Dong or 0.70 USD, which is very reasonable for the information provided. The museum is a square building with 4 floors, each floor features different information from the war. The exhibits range from showing the affect of agent orange poisoning on Vietnamese people while another exhibit shows pictures from the war and information from newspaper cutouts. 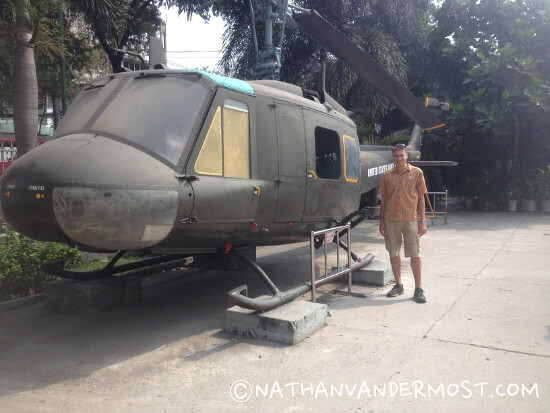 Outside the museum you will find U.S. military aircrafts used in the war including helicopters, planes and tanks. There is a lot of information provided at the museum and you could easily spend a whole day there. Be aware that a lot of the content is very graphic and disturbing. We spent about 3 hours at the museum and I was not able to finish reading all the informational content. But, it was definitely a highlight of Ho Chi Minh city. Located in the center of the city is a Notre Dame cathedral replica. Although, it does not look entirely the same as the original in Paris, France. The cathedral is still very impressive. Mass was in session when we visited in the evening but we were able to get a small glimpse of the inside of the church. 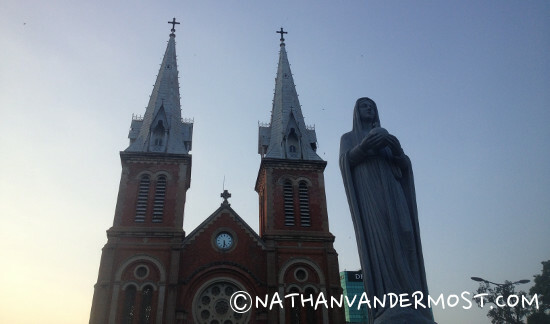 There was a statue of the virgin Mary in front of the church and many tourists looking for the perfect photo. 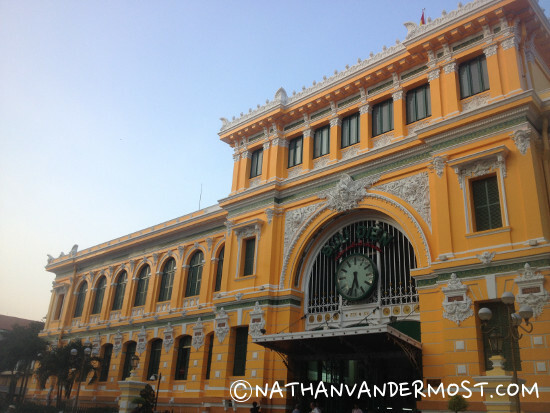 Next to the Notre Dame cathedral in Ho Chi Minh City is the old central post office. This is where all telegraphs were sent and an important location for gathering communications prior to current technology. The inside of the post office features travel agents, currency exchange, and common Vietnamese themed gifts. Definitely worth a visit if you are in the area. 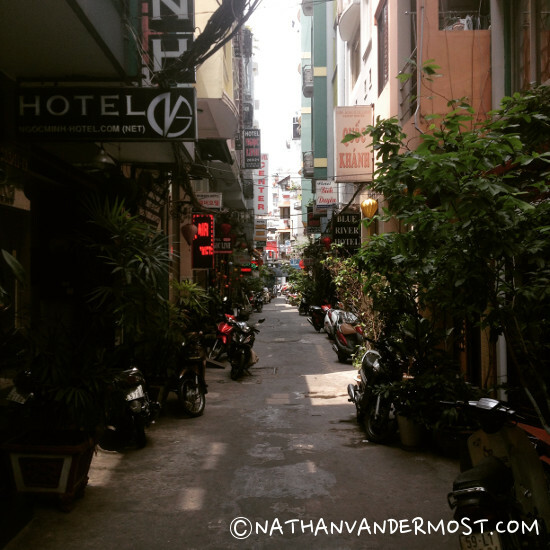 The market is fun to see if you have not been to many markets in Southeast Asia. This market is very touristy and features many of the same Vietnamese gifts that can be found on the street and at other markets in Ho Chi Minh City. The market is covered from the sun which is nice but it was very crowded when I passed through. If you are in the area then it is worth a visit.